SoftPlanet makes it possible for everyone to get free SlimCleaner download directly from our servers. There is no registration needed for downloading. SlimCleaner 4.0.30878.55015 is a software application, dedicated to boosting your computer performance. You will probably ask how actually it can do such an important job. The answer is pretty simple. It is capable of getting rid of all junk data you have stored on your computer. This utility can also help you increase the battery life of your mobile device. 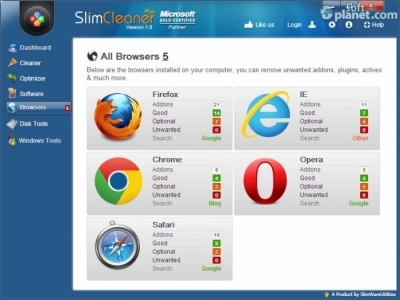 Like most modern PC boosting applications, SlimCleaner 4.0.30878.55015 is cloud-powered as well using a tool called SlimWare Cloud. It delivers up-to-date information about your software. If you use a laptop/netbook you really need to save your battery life in order to increase the work time. This utility is able to handle such a task with ease. Everybody wants to use the capabilities of its PC to the maximum. 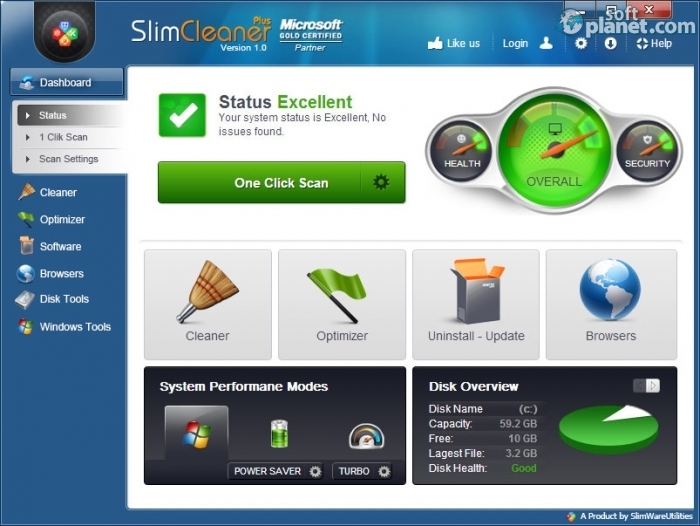 SlimCleaner 4.0.30878.55015 allows you to boost your computer performance, so you can get the maximum of its potential. 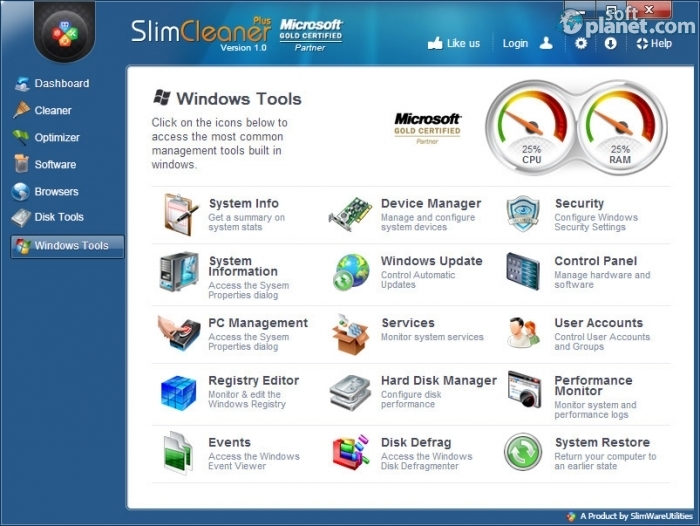 SlimCleaner 4.0.30878.55015 is the lightweight software solution if you are looking for a PC performance boosting utility. It will really provide you with a great tool kit. It has a very well structured interface, which makes it appropriate for both beginners and advanced users. The application comes with a Microsoft Gold Certified badge. Our security scan shows that SlimCleaner is clean from viruses. The current version of SlimCleaner has been scanned by our system, which contains 46 different anti-virus algorithms. That ensures that SlimCleaner 4.0.30878.55015 is 100% safe for your computer.